Before construction begins on a home, a solid architectural plan is laid out to guide the construction team. Your real estate business should start the same way. 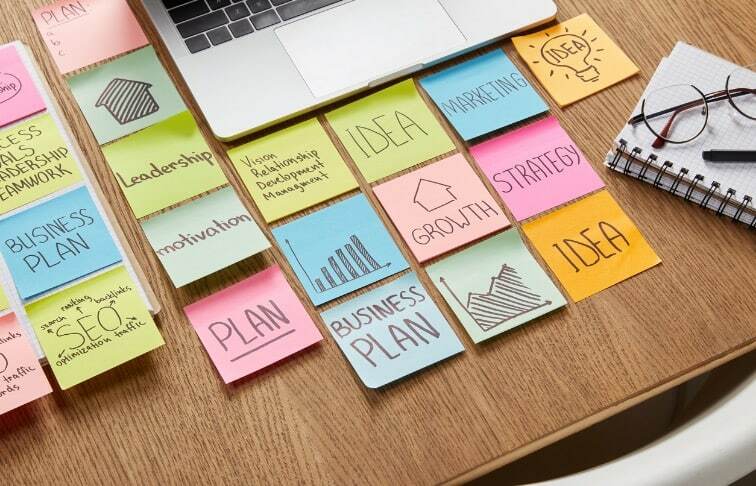 A real estate business plan may seem daunting to create, but it is critical to developing a strong, sustainable business. When done correctly, a real estate business plan can help you define and measure your goals and keep you focused on growing your business. We have seven steps to creating a strong real estate business plan. Think of your business plan as a blueprint for success. What are your goals? What steps will you take to accomplish those goals? How will you measure success? When developing your real estate business plan, be sure to include these seven key components. Your real estate mission statement is quite simple. It answers the question: “What do I do?” It should clearly define your purpose and include your specific value proposition or the benefit you provide. SWOT is a standard acronym used for business plan building. It stands for Strengths, Weaknesses, Opportunities, and Threats. A SWOT analysis is an assessment of yourself as a real estate agent and the landscape of the industry where you practice. Knowing who you are up against, and how you are better (or worse) than those you will be competing with, will help you to set strong goals for seizing opportunities, boosting your strengths, and improving your weaknesses. What do you want to achieve in your real estate career? Do you want to make $6,000 a month? Write that down. Do you want to sell 12 properties each quarter? Write that down. Your goals may change down the road, but that’s okay. Consider both your short-term and long-term goals. Separate your real estate business goals in these two categories to ensure that your short-term goals feed your long-term ones. FREE DOWNLAOD: How do you find the right brokerage as a new real estate agent? What strategies will you put in place to achieve your specific goals? Be as specific as possible, and don’t worry if you’re not sure how you’ll execute. Your real estate business plan should be a living document, changing as your business and your abilities grow. For example, maybe you want to attend two real estate conferences a year, but you’re not sure you can afford it. Write it down anyway. This is where you map out your biggest and best ideas. What is your time frame to achieve each of these real estate business goals? Do you want to set up your real estate website in the next two months? Grow your sphere of influence by 50 contacts in the next three weeks? Obtain your broker’s license by the end of year three? Adding a time frame to your goals and strategies will help you stay accountable and focused on achieving specific goals within a certain time frame. What type of properties will you buy and sell? Commercial? Residential? Who will be your target customers? Luxury home buyers? Families relocating to the area? Defining your audience and your market, and considering your market along with your goals, will help you target your strategies. If you’re unsure whether a particular strategy will help you meet your goals, you can take a look back at your real estate business plan. Reevaluate the relationship between strategy and goals, then make the proper adjustments. Determine specific systems and processes that you plan on using to achieve your real estate business goals. Keep track of systems that you may want to grow into. For example: Will you use a CRM system for keeping track of clients and their needs? Do you have specific marketing programs that you plan to use? Make sure that your real estate business plan is results-driven. Each step should require action from you, and you have to be disciplined enough to perform those actions. Otherwise, you just have a piece of paper sitting in a drawer. It’s up to you to drive your success. Take some of these pointers or take all of them, but always take the time to evaluate your real estate business goals and how you plan to achieve them.